According to a World Bank report on Lao in 2017, the country pleasantly surprised many by becoming one of the fastest growing in the region. The World Bank even ranked Lao as the 13th fastest growing economy of 2016. Bloomberg forecasted last year that the country will continue to grow, sustaining at least 7% growth until 2019. One of the contributors to the country’s rapid growth is its expanding energy segment – most notably the hydroelectric sector. While Lao might be landlocked and surrounded by much wealthier countries such as Vietnam, Thailand, China and Cambodia, Lao has been blessed with great hydropower potential. Lao’s geographical terrain provides ripe conditions for hydropower energy. The country faces monsoons from two different directions, from the Gulf of Thailand and the Gulf of Tonkin which makes precipitation high and favourable for hydropower generation. The Mekong River which flows through Lao and acts as a natural border between Lao and Thailand is one of the main sources from where hydropowered energy is extracted. 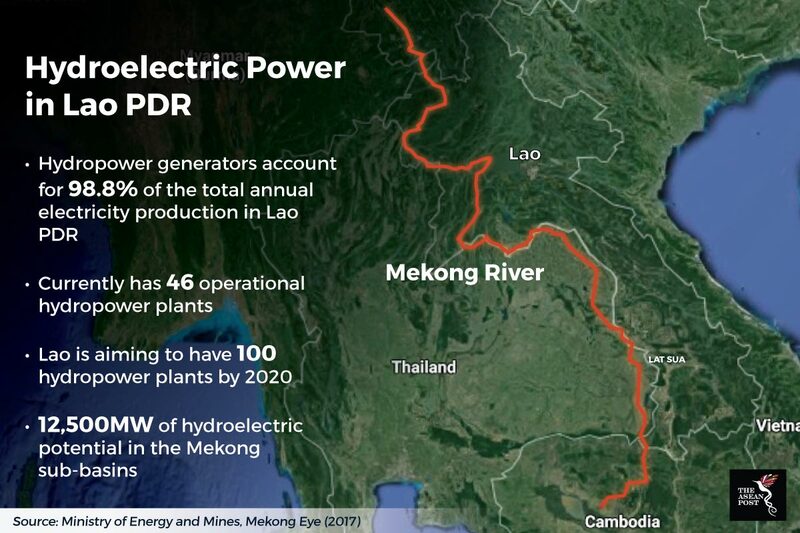 According to the Ministry of Energy and Mines, Lao has a theoretical hydroelectric potential of about 18,000MW excluding the mainstream of Mekong. Of this, 12,500MW comes from the major Mekong sub-basins while the remainder comes from minor Mekong or non-Mekong basins. At the moment, Southeast Asian legal, tax and investment advisory firm, DFDL highlighted in their 2017 report that Lao’s hydropower generators account for 98.8% of the total annual electricity production in the country. However, as the country continues to grow economically, demand for energy would naturally follow suit. The Ministry of Energy and Mines pointed out last year that energy demand in Lao by 2025 is expected to increase to 4,500 kTOE from about 2,700 kTOE this year. Aside from internal demands for energy, Lao has also made significant gains in exporting electricity to its neighbours - Thailand, Vietnam and Cambodia. Data from the Ministry of Energy and Mines shows that during just the first six months of 2017, Lao exported more than 10.877 million kWh of electricity, worth more than US$596 million. Even Malaysia has started importing electricity from Lao. According to the Ministry of Energy and Mines in October 2017, Lao has agreed to sell 100 MW of electricity to Malaysia via Thailand’s power grid. Lao is also looking to export 100MW of power to Singapore and 200MW to Myanmar by 2020. With such high demand for electricity, it is no wonder the government is investing in developing more power plants in the country. According to the Mekong Eye in July 2017, Lao are expecting to operate 100 hydropower plants by 2020. The 100 power plants will have a combined installed generation capacity of 28,000 MW and an annual power output of about 77,000 million KWh by 2020. Lao’s ambition to be “Southeast Asia’s battery” could well materialize if they can manage to fully extract their hydropower potential. However, the focus on hydropower can be harmful too. Activists and environmental NGO’s have pointed out the negative environmental impact of building hydropower plants. As Lao builds more and more hydropower plants to fuel the growing demand, they could do some serious damage to the country’s environment. The report from DFDL also revealed that Lao has other renewable energy potential too – particularly solar power. Lao PDR has an average of 1,800 – 2,000 hours of sunlight per year and solar irradiance levels in the Lao PDR are between 3.6 – 5.5 kWh/m2 per day. According to DFDL, this shows that Lao has great potential to provide electricity in remote areas which are off-grid. Also, increasing the use of solar energy in the country will play into the government’s goal of increasing renewable energy (excluding hydropower) production. If Lao manages to tap into solar power while consolidating their hydropower energy, Lao could be a major player in the renewable energy market in the future.